Sometime in the next 13 months, Keizer is getting a new stream of revenue for its general fund. Last week, the Keizer City Council signed a ground lease with a cinema developer for property Keizer owns on the west side of Keizer Station. Construction is expected to begin in March for a nine-screen theater across from the transit center on Keizer Station Boulevard. For Keizer City Manager Chris Eppley, the lease brought to fruition an idea he’d championed for most of his 18 years at city hall. When the cinema owner wanted to purchase the property, Eppley presented an alternative in the ground lease. “You can do three things with property: sit on it for a future sale, sell it or lease it. The advantage and disadvantage of selling are that you get a big pot of money all at once, and city councils tend to spend big pots of money the city gets all at once,” said Eppley. Case in point: the property next to the cinema site on the corner of McLeod Lane Northeast and Lockhaven Drive Northeast. The city sold that parcel of land to Salem Radiology in 2011 for $1.4 million, then spent it acquiring property for the land that became Keizer Rapids Park. Keizer purchased the Keizer Station land more than a dozen years ago in an effort to acquire the rights-of-way and bundle the property that became Keizer Station for sale to developers. In the intervening years, much of it has been sold to developers, but the city has retained ownership of the cinema site, a piece of land across the street, west of the Keizer Transit Center, and a third site on the triangle-shaped land bordered by Chemawa Road Northeast, Lockhaven and McLeod. Past city councils have opposed leasing property in favor of selling it for reasons connected to other priorities, like Keizer Rapids Park, and some that are more philosophical. “The primary question has been whether the city should be in the business of entrepreneurship? That’s a good question, I said ‘yes,’ but other councils have said, ‘no,’” Eppley said. The current city council was the first to offer its approval, which means the city expects to collect about $12,000 a month in rent for the foreseeable future with a 2 percent increase every year. The current lease contract is for 50 years with options to extend it up to 99 years. Keizer will owe a broker 20 percent of the rent for the first 20 years, but it still amounts to nearly $120,000 annually. It’s not a huge sum, but it will take the sting out of the money the city is asked to pay into the Public Employees Retirement System (PERS), which comes out of the general fund. The only streams of revenue for the general fund are property taxes, franchise fees and monies the city receives from the state. The crunch the city feels at such times doesn’t typically mean layoffs, but it might mean positions go unfilled for a lengthy period of time before new hires are brought it. That exact scenario was one of the culprits that left Keizer Police Department understaffed for the past several years. “This helps us insulate us from swings in other places. I am going to try to perpetuate this with other property the city owns,” Eppley said. He said the parcel across the street from the cinema could easily accommodate a 10,000-square-foot retail space. While the steady revenue stream is a boon for the city, it is not without some risk. If the cinema owner defaults on the lease agreement before the building is fully constructed, he must return the property to its natural state. A default after construction is complete means Keizer would own the theater. No one foresees a problem in meeting the obligations of the lease, but Keizer also has had issues in the past. When developer Chuck Sides defaulted on a $26 million in city-backed bonds in 2011, Keizer had to extend its Urban Renewal District to settle the debt, a situation that meant pleading with affected taxing agencies for approval. While the debt was settled more quickly than expected, the fiasco effectively killed all programs associated with improving River Road North. Eppley isn’t sure what Keizer would do with the reins of a movie theater, but he’s hopeful it never comes to that. “It’s not a traditional way of doing business for a city, but we are not a traditional city,” Eppley said. 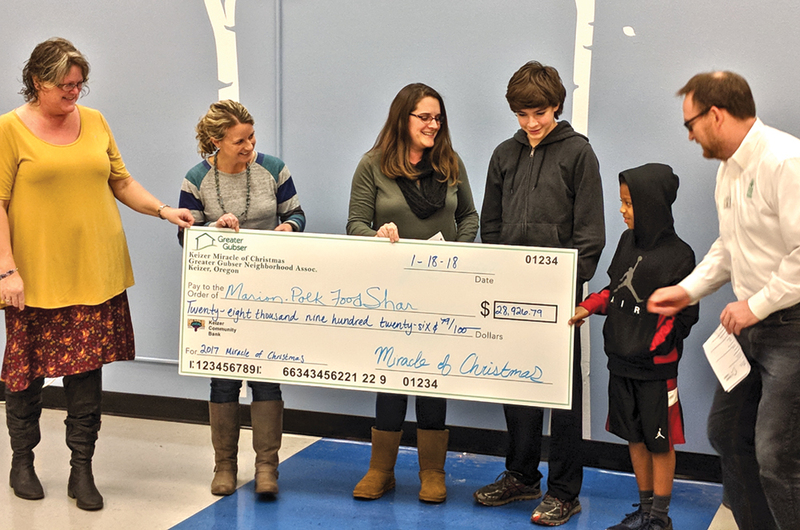 The Gubser Miracle of Lights Christmas had a banner 2017 season resulting in a major donation to the Marion-polk Food Share at the Greater Gubser Neighborhood Association last week. The 24-day run of the lights display yielded financial donations of $28,926.79 (an average of more than $1,000 per day) and record 27,180 pounds of donated food. Volunteers tending the donation booth also gave out a record 34,000 candy canes. The cash donation is equivalent to more than 109,000 meals for local families in need, said Rick Guapo, president of the food share. In the past five years, the Miracle of Light has generated more than 500,000 meals. 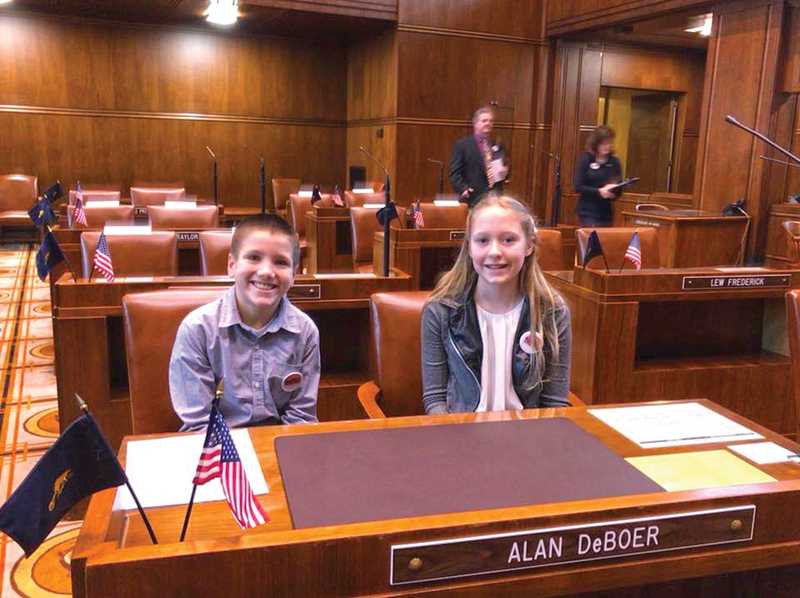 The organizers were honored with the Oregon Food Bank Association’s Hunger Buster Award in 2017. More than 80 percent of the homes along the display route participated in the 2017 display. Sponsors this year included: Dana Burk representing Keller Williams, Brenda Oleman representing Serenity Cleaning, Maps Credit Union, Lisa and Devin Campbell representing Print Specialties, Gerald Nichols representing McKinley Landscape, John representing JK Timber and Lisa Lathan representing HomeSmart Reality. The Keizer Chamber of Commerce held its annual First Citizen banquet last Saturday and they hit it out of the park with the four who won awards. Joe Egli was announced as Keizer’s First Citizen Award to sustained applause. The creators seemed to have Egli in mind when they conceived of the award. Few First Citizens have had their fingerprints in so many different areas of Keizer life. His resume is dizzying. A life-long Oregonian and a long-time Keizerite Egli has served in public capacities, committee member; he served one term as a Keizer City Councilor. A born leader, Egli has served as president of both the Keizer Chamber of Commerce and the Keizer Rotary Club. But it is in his role as resident he has displayed his most far-reaching influence. Every major project in Keizer over the past two decades has had Egli as a cheerleader. His gift for rallying support and volunteers for projects as diverse as The Big Toy, the artificial turf at McNary High School, leadership of the Iris Festival and his the Salem-Keizer Education Foundation is legendary. Egli and his wife Shelly comprise one of the most productive teams when it comes to their home. He does what is needed to be done without seeking the spotlight or credit. As he said himself as he accepted his award, it’s all about the people in Keizer. Yes, it certainly is, Mr. Egli. The pattern to the awards seemed to be multi-tasking. The Merchant of the Year award was presented to Larry Jackson of Jackson’s Body Shop. When volunteers are called for, Jackson is one of the first in line. He serves on the board of directors for the Chamber and volunteers as one of the Men of Action in Keizer (MAK). Christmas displays? Does it. Iris Festival? Does it. Big Toy? Did it. Larry Jackson was very deserving of the Merchant of the Year award and he will continue his good civic works and continue to inspire others to pitch in and help in his community. For that the community thanks you, Larry. Another multi-tasker honored Saturday night was Jason Flores who was presented with the Service to Education Award. Over the years this award has been bestowed on teachers, administrators, coaches and boosters—all of whom have had a positive impact on Keizer’s school kids. A residential builder (Celtic Homes, LLC), Flores devotes just as much time to Keizer kid’s sports as he does to his own business. For more than 15 years he has coached baseball, softball and football for youth teams. Along with coaching and mentoring he has also been deeply involved with projects such as the Keizer Little League fields, the turf, refurbished scoreboard and softball dugout projects at McNary High School. Like all good volunteers he puts money where his heart is. He and his wife Keri sponsor students in their chosen sport through the McNary Athletic Booster Club’s Adopt-an-Athlete program. Youth sports in Keizer are a success due in part to community volunteers like Jason Flores. At their discretion, the Chamber of Commerce leaders present their President’s Award. The recipients of this award over the years have been a varied group who have made indelible impacts on the Chamber and the city. Nathan Bauer, president of the Chamber’s board of directors, made an impassioned speech before announcing he was honoring Matthew Lawyer, who was stunned by the announcement. Matthew Lawyer is the future of Keizer volunteering and leadership. A man who doesn’t know how to say no, can be found involved with community projects as well as projects that are his personal passion—he is a board member of Keizer Homegrown Theatre (he has quite the stage presence). On the public side he serves on the Keizer Parks and Recreation Advisory Board where his passion for the city’s parks is evident at every meeting. He has a young family and his concerns mirror those of most Keizer households, which is important. He is also a member of the Keizer Planning Commission, one of the most important bodies in the city. The commission is the first stop in the process for developers and contractors to get green lit by the city council for their projects. His sober, realistic views will be valuable when time comes to seriously discuss future growth in the guise of an Urban Growth Boundary expansion. What does any of this have to do with the Keizer Chamber of Commerce? Everything…when you help make the city a great place to live and run a business, that’s the Chamber’s mission. Full stop. Congratulations to all the recipients of this year’s awards. Episodes of congressional disarray feed an ideologically loaded narrative that government is hopelessly incompetent and can never be counted on to do much that is useful. Even if President Trump and the Republicans ultimately come to bear the burden for Washington’s disarray, episodes of this sort bolster the standard conservative view of government as a lumbering beast whose “meddling” only fouls things up. The private sector is cast as virtuously efficient and best left alone. The power of this anti-government bias is enhanced by our failure to revisit government’s successes. We don’t often call out those who wrongly predict that activist politicians and bureaucrats will bring on nothing but catastrophe. In fact, in the most capitalist of terms, the initiative worked spectacularly well. Auto sales rose for seven straight years starting in 2010, before finally taking a small dip in 2017. On May 29, 2009, GM stock cratered to 75 cents a share—yes, 75 cents. The restructured company went public again in 2010 at $33 a share, and it was trading at around $43 a share last week. Fiat Chrysler, the merged company that came out of the government-led restructuring, debuted on the New York Stock Exchange at $9 a share in October 2014 and is now trading in the range of $24 a share. Although Obama organized the details of the rescue and took the heat for it, former President George W. Bush deserves some credit here. While he was initially reluctant to do so, Bush responded to Obama’s desire to keep the future of the companies open. He eventually fronted GM and Chrysler some $25 billion from the funds set aside for the bank bailouts after the economic implosion. Bush said in December 2008, “If we were to allow the free market to take its course now, it would almost certainly lead to disorderly bankruptcy.” For such a staunch capitalist, it was a candid—one might say courageous—admission that the market, operating on its own, would create chaos. And this bedlam would have taken a severe human and social toll, since the job losses from that “disorderly bankruptcy” would have hit not only the auto companies themselves but also their suppliers and other enterprises, large and small, that served them. Instead, Michigan, along with other parts of the region, has staged an impressive comeback. The state’s seasonally adjusted unemployment rate peaked at 14.9 percent in June 2009, fell to 5.1 percent by December 2016, and has continued to drop, to 4.6 percent last November. In Detroit itself, unemployment declined from 28.4 percent in June 2009 to 7.8 percent in November 2017. Wages, it should be said, have not fully recovered from the Great Recession. The real median household income in Michigan stood at $57,910 in 2006, sank through 2010, when it hit $50,943, and was at $57,091 in 2016. So there’s still work to do. But imagine what the trends would look like if government had made the irreversible choice of letting GM and Chrysler go under. Elitism. It is a powerful word. Recently that word has been brought up in a nationally-syndicated opinion column with disparaging comment that it should be drummed out of Americans and all things American. Defined, it refers to a group that is considered superior to the remaining members of the group in terms of ability and qualities, and is also used to identify those in the group having the greatest power and influence within a society due to their wealth and privilege. My reading of the U.S. Constitution, its companion document, the Bill of Rights, and our nation’s laws and related applications, is that there has been an effort from the beginning to drive a stake through the heart of elitism even though those persons responsible for getting the United States underway in the late 18th century could be viewed as the elites in Colonial America, those who led the Revolutionary War and the ultimate break from England’s rule. Incidentally, in every person’s inimitable way he’s an elitist: it’s the human nature in all of us that’s inclined to judge other persons as below us or inferior. Recorded history of the world could be described as people—back to the Egyptians—and even earlier, surrendering their lives to elites by permitting themselves to be ruled by the elites. These would have been the pharaohs, the emperors, the czars, the kings and queens and the rulers back to the birth of civilizations. In fact, world history suggests that the human species has items in its DNA, resulting in surrender of freedom, and the right of every member to protect himself in return for control by the most wealthy and powerful in their midst. In North America and throughout the world of yesteryear, humans struck out on their own to escape control as one can learn by reading about those who ventured away from civilizations east of Polynesia and settled the Pacific Ocean, the tribes that used the once-solid bridge of land between Asia and what is now Alaska, and the pilgrims of Europe, England, and the Netherlands, that sailed away to religious freedom in what became colonial America. People, virtually forever, have wanted freedom but sooner or later have surrendered to controls by the elites in their societies, those richest in goods and greatest in power. We bring our loss of freedom and self-determination on ourselves because we want a measure of safety and security we are not able to provide for ourselves. If we do as we please and, in doing so, break the law then we face the consequence of fine or imprisonment. If we set out into hinterlands to establish our own little fiefdom, we soon are held responsible for what we do by a force more powerful than ourselves that comes to us because all of America, deep in the woods and out in deserts, is owned or controlled by the most wealthy and powerful among us. We cannot therefore avoid or escape elitism. These elitists dictate whether we like it or not because these are the people among us who have managed—by inheritance, hard work, mental ability—to accumulate the most wealth and power. Although we argue we are a nation of laws, not men, we end up in daily life by subtle or direct control, or simply surrender, to those, we choose by voting in America, often with the most wealth and power. Reminder: We recognize, too, it is in the nature of most all of us to view virtually everyone else as, by subjective judgment, lesser than ourselves. The average American can do little about his plight of powerlessness except by pen, voice and vote. If I’d been granted what’s required to stand tall among those with wealth and power, I might have had more power and privilege other than effort at persuasion by columns. I am not wealthy and thereby not powerful but appreciate the fact that I can openly express my ideas in a nation that generally respects its Constitution enough to allow me to do it. Elsewhere, I could be incarcerated or murdered, although the level of intolerance for expressions “too contrary” or “blasphemous” can get a person “in deep trouble” here. Elitism is here and here to stay and has been since the “beginning of time.” There’s no way in modern times to rid ourselves of it because our planet has been “civilized” from stem to stern. And there’s no way to escape, not even by death, as the authorities will do with my body as law dictates. But not to despair! As is true of all Americans, the nationally syndicated writer who disparages those he views as elitists has the freedom to criticize “them,” as do we all. Meanwhile and always, the American freedom of speech is preciously powerful and must be protected at all cost from those who would demagogue or dictate.